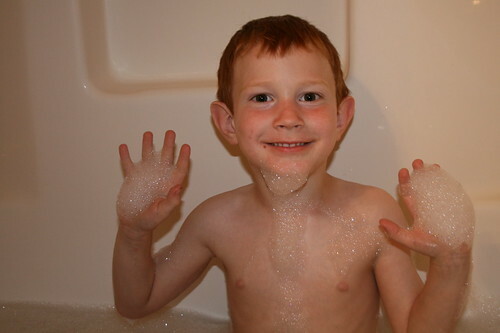 What do you do when you have a grouchy monster, oh, I mean little boy, that doesn't want to take a bath? I thought about making threats, bribing him, or just over powering him. I finally came up with a great way to get him in that didn't harm him or get me all wet. How is it that some kids love baths and some hate them? Bubbles are a great idea though. Oh, it's not that he doesn't like baths, he just didn't want to take one. He usually jumps at the chance to play in the tub.